It was almost exactly one year ago that Facebook launched Places, their location-based offering. Reading the press at the time, you would have thought it was going to be the Foursquare-killer, the Gowalla-strangler, the Loopt-beheader, etc. Nevermind that Facebook partnered with all of them for the launch — those guys were done. Fast forward to today: Foursquare recently raised a large round of funding valuing them at $600 million. And Facebook is killing off Places. To be clear, Facebook is not ducking out of the location game itself. In fact, you could say that they’re doubling-down on it. But they are moving away from the game that the “check-in” services have been playing. And a result of that is Places being killed off and being replaced by new “Nearby” area, as Jason outlined along with the bigger privacy changes today. Reading over Facebook’s own post on the location changes, it wasn’t entirely clear what these changes meant for the concept of the check-in itself. But this page appears to make it a little more clear. As I read it, check-ins will remain as a part of the product, but they’ll no longer be emphasized. It seems that the hope is that people will move away from thinking of location in terms of “checking in” and instead think about it in terms of tagging your location to what ever it is you’re doing — sharing a thought, posting a picture, etc. This is smart, as it’s something none of the other location services have really nailed yet. And now that location is being emphasized on every Facebook action (though it can easily be turned off) — and not just on mobile — a lot of people are going to use it. Location as a layer of context is about to get a big upgrade. All of this is also smart from a location-based advertising strategy. It’s more data and more strong signals. What I’m not yet clear on is what this means for Facebook’s location-based deals service. Launched alongside Places last year, it would seem that this never really took off. And Facebook doesn’t mention it today. I’ve reached out to them to clarify. The video on the location info page details how location tagging will work. The default on facebook.com appears to be city-level, and there’s a secondary location button to add an actual venue (which is then inserted into your status message). You can also add location to photos you’ve already posted. The video also points out that on mobile devices there will still be a check-in button, but the functionality will be different. It apparently will only exist as a part of a status update and there will be no more big blue “Check In” button that inserts your check-in into a stream of other check-ins (and again, no more Places area itself). Instead, once you select a place, it will simply be tacked on to the end of your status message. Location sharing will also be tied to the more direct and simplified privacy changes Facebook outlined today. Once someone tags where they are on Facebook, they will be directed to the News Feed. 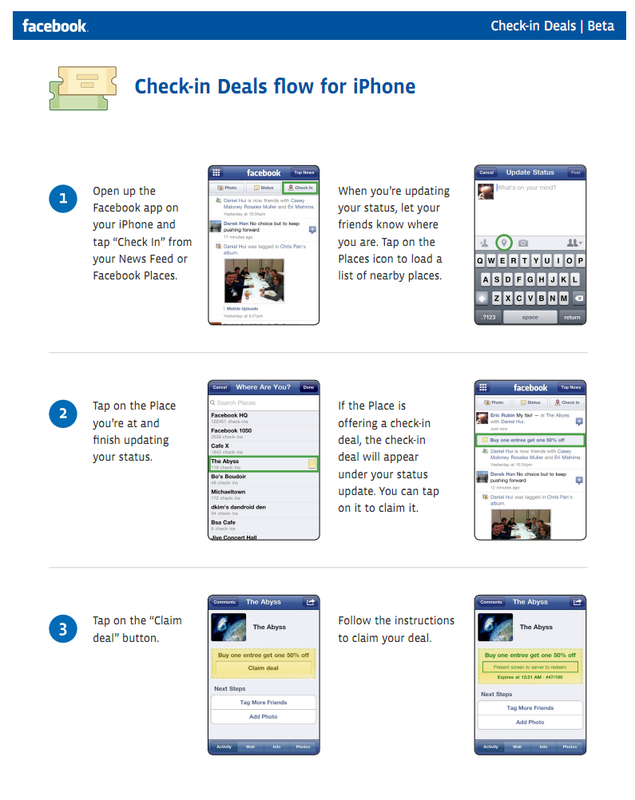 If the Place is offering a Check-in Deal, the title of the deal will appear below the News Feed story. You’ll then be able to click on the deal title and will then be taken to the claim flow. Below, find the flow diagram of how it will now work.